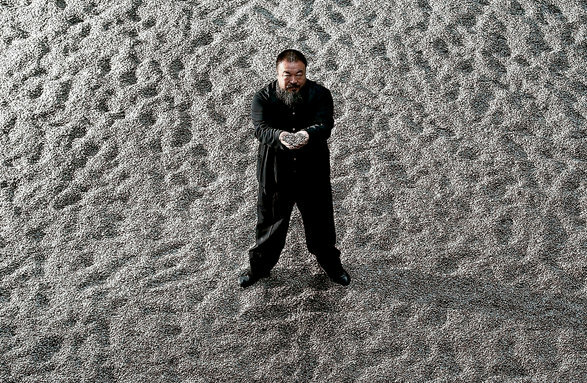 The Chinese Government has destroyed the studio of Ai Weiwei, a protean artist who is one of the most outspoken critics of the Chinese Communist Party. Even though he said officials told him that the demolition would not take place until after the first day of the Year of the Rabbit (which falls on February 3rd) he was shocked to discover that workers had begun knocking it down today. Sad news. They also knocked down a neighboring studio he had designed for a friend. Mr. Ai's studio was to be used as an education center and a site for artists in residence. Weiwei compares the seeds in his current installation at the Tate Modern to Twitter "...a vast sea of ideas and communication contributed by individual people." 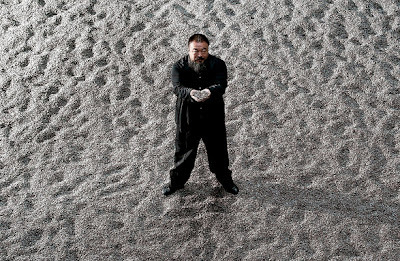 Weiwei had the seeds made in the southern Chinese city of Jingdezhen. Each of the 100 million seeds was molded, fired, and painted with three or four individual brush strokes, often by women taking the objects home to work on them. One thousand six hundred people were involved in the process. 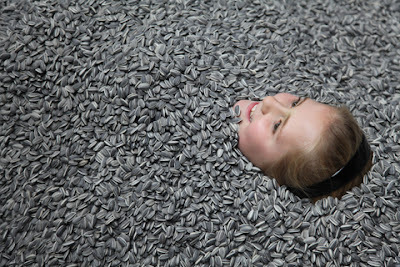 Although the installation was intended to be interactive and in the fist few days of the show people were allowed to walk on them and pick up the seeds, this has resulted in the release of dust from the individual "grains" rubbing together. The dust could "be damaging to health following repeated inhalation over a long period of time." 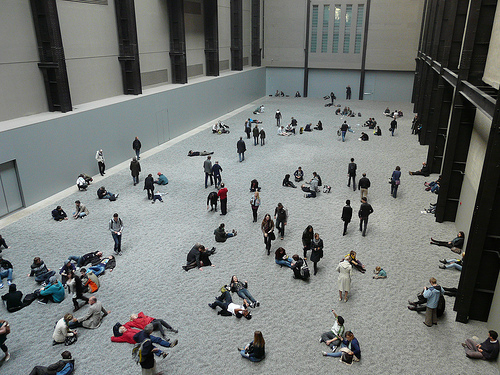 Visitors are now limited to looking at the installation from behind a barrier and they are not happy. I personally would assume the entire 'feeling of the installation would be pointless without having the interaction with the piece.